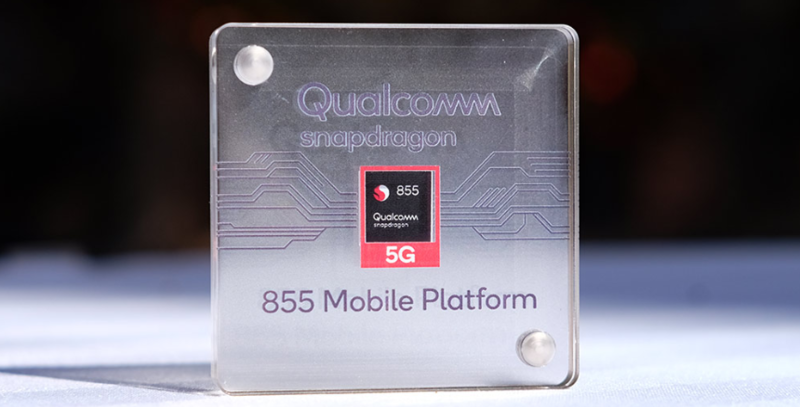 Qualcomm took advantage of the second day of the Snapdragon Summit to officially unveil Snapdragon 855, its newest platform for top-of-the-line devices. The chip had already been commented the day before, during the announcement of news for 5G, but now we have all the details about you. The Snapdragon 855 arrives as the first native compatible chip with 5G networks, but Qualcomm has gone further, including a dedicated NPU for artificial intelligence-related data processing, much more powerful GPU than the previous generation, new Kryo cores and several other news. To make things easier, everything has been separated into five pillars: connectivity, performance, AI, entertainment and camera, and of course the full spec sheet of the new high-end mobile platform. The Snapdragon 855 features support for sub-6 GHz networks and new mmWave antennas, ensuring full support for 4G bands with up to 2 Gbps and also the next 5G, including all tracks that will be used next year in select cities around the world and also the others that should arrive until the end of 2021. Regarding Wi-Fi, we support the sixth generation of the wireless connection and energy efficiency up to 67% higher, using an 8×8 system for better distribution to multiple devices. Security has also been increased with WPA3, plus support for mmWave Wi-Fi networks supported by Qualcomm’s 60 GHz platform. This is the first platform based on the 802.11a standard, with up to 10 Gbps connection speed and equivalent latency for wired connections. We even have enhancements for wireless audio playback with the new Qualcomm TrueWireless Stereo Plus technology promising to reduce the latency between headphones and also increase energy efficiency, thus ensuring a more immersive and lasting experience. Qualcomm has managed to deliver even better performance for its new platform, making Snapdragon 855 the best choice within the Android ecosystem. It all starts with the new Kryo 485 CPU cores, which promise an approximate 45% gain over what we had in Snapdragon 845. As expected, a new core organization was used, is a more powerful “Prime” clocked at 2.84 GHz, three “Performance” clocked at 2.42 GHz and four “Efficiency” clocked at 1.8 GHz. It is worth noting that each core has its own L2 cache, but all share the L3 cache for ultra-fast communication between them, besides of course the system cache itself. For the public looking for a game-oriented flagship option, the Adreno 640 GPU will deliver even greater graphics performance, outperforming the Adreno 630 by up to 20%. To further increase immersion, the company has added three technologies: Vulkan 1.1, HDR (high dynamic range) and PBR (physical based rendering), which will give differentiated visibility of the game compared to other GPUs in the mobile market. One of the biggest difficulties for those using top-of-the-line chipset is finding an option that provides good battery management coupled with performance, and this was a fix for Qualcomm with the Snapdragon 855. According to the company, the new 7-nm manufacturing process in conjunction with the new core organization, use of Artificial Intelligence and other optimizations have resulted in increased energy efficiency by up to seven times in some cases compared to Snapdragon 845, such as playing HDR videos on YouTube. Another important factor is that energy efficiency also reduces the risk of thermal bottlenecks in Snapdragon 855, and it is possible to maintain “stressful” activities for a much longer time without sacrificing performance, and consequently spending more time away from the power outlet. 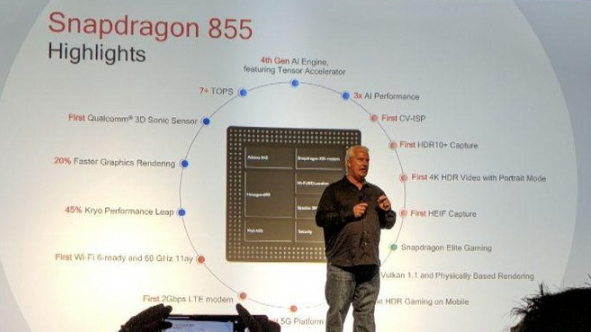 The Snapdragon 855 arrives with the title of the most intelligent mobile platform of today, having as main differential the maximum exploitation of Artificial Intelligence with the arrival of the new Hexagon 690 core with a tensor accelerator. 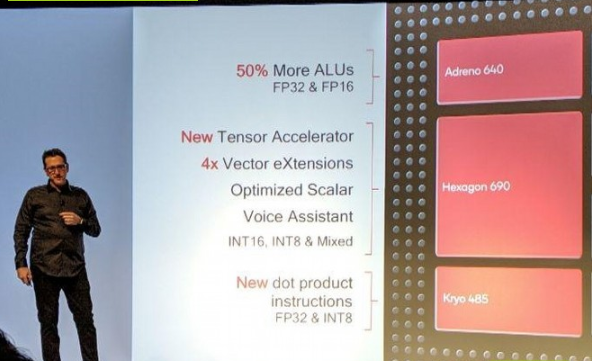 Developed by Qualcomm especially for this type of task, we have the possibility to perform up to 7 trillion operations per second with the fourth generation of the AI engine, increasing in three times the performance seen in Snapdragon 845 and being twice superior to the competitor, which we believe we are the Kirin 980 for the “tips” given during the presentation. All this in conjunction with the Adreno 640 and the new Kryo 485 cores allow the Snapdragon 855 to deliver maximum fidelity and immersion in tasks that demand high processing power since Artificial Intelligence is used to “facilitate the way” for the arrival of functions even more complex without this entails in a high energy consumption. 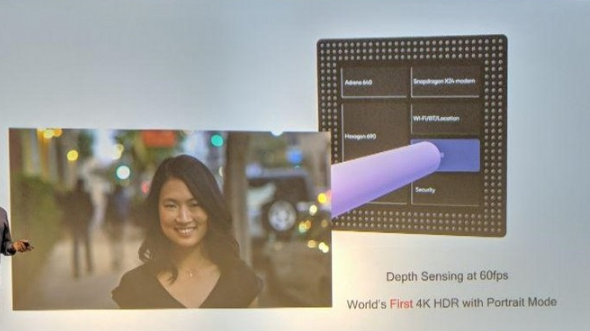 This was probably the highlight of the presentation, with Qualcomm demonstrating a major breakthrough in the image processing power of its new Snapdragon 855 compared to its predecessor and also compared to competing platforms. It all starts with the new Spectra 380, the world’s first ISP with integrated Computer Vision. CV-ISP enables functions such as recording videos in 4K HDR at 60 fps with real-time bokeh effect as well as background edits such as colour change or scenery. Finally, it was also announced support for 4K video recording with HDR +, increasing to more than 1 billion available colour tones. No details were given on when compatible handsets would hit the market, but Qualcomm said at least one major company would have enough technology to do so. Was it Sony? 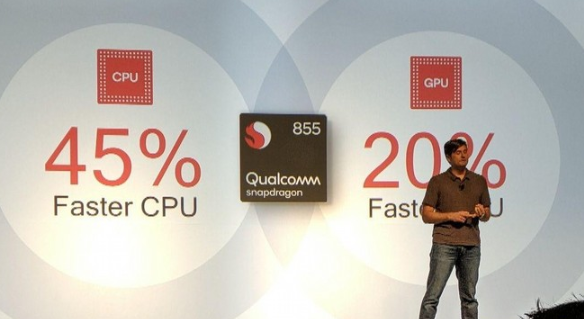 More impressive, however, is the ability to perform such functions with a power consumption up to four times lower than we would have in Snapdragon 845 since here is used only the core image processing while in the predecessor we would have several sectors working together to perform the same function. To take advantage of all this new technology, Qualcomm has announced the High Efficiency Image File (HEIF) support, enabling the image file itself to be able to store information that goes far beyond what we currently have, including depth map, masks, multiple captures, animated photos and more, all with up to 50% less file size than JPEG. In entertainment, Qualcomm focused mainly on three main areas: games, videos and mixed reality. In games, we had the arrival of Elite Gaming. This includes a series of optimizations not only in performance but in display, development, connectivity, immersion, audio quality and more, using all the technologies discussed above in partnership with developers to bring the best possible experience while playing on your smartphone. With regard to the videos, we have the arrival of HDR10 + playback for the first time on a commercial smartphone as well as Dolby Vision. We also have the possibility to play HDR videos at 120 fps and mixed reality content in 8K resolution at 360 degrees. 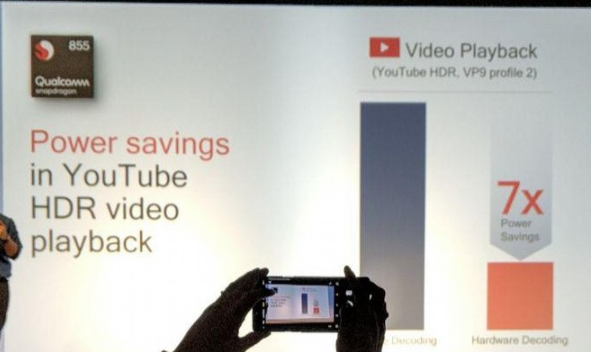 In addition, the arrival of hardware acceleration with H.265 and VP9 allows greater energy efficiency, ensuring seven times less consumption when running HDR videos on YouTube. In mixed reality, we first have the audio enhancements with the Qualcomm aptX Adaptive and Qualcomm TrueWireless Stereo Plus, which help further increase immersion by consuming this type of content. With the help of future 5G networks, however, this will be lifted to a new level, with real-time broadcasts and interaction at a never-before-seen level. Qualcomm has announced that the first company to introduce a device with Snapdragon 855 will be OnePlus. Several users believed that Samsung was going to come out ahead with the presentation of the Galaxy S10 during the MWC 2019, however, the Chinese manufacturer must make available its first flagship with support for the 5G connection, possibly at CES 2019. Although there is no confirmation, it seems to be OnePlus 7, given the announcement date of the previous versions and the fact that the company does not manufacture more than two tops per year.